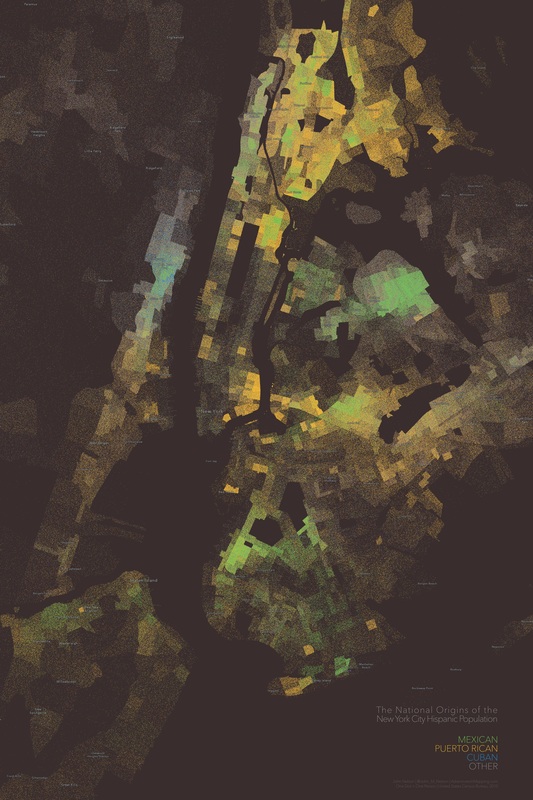 Here is a multivariate dot density map of the Hispanic population of New York City, tinted by Census counts of national origin at the tract level. 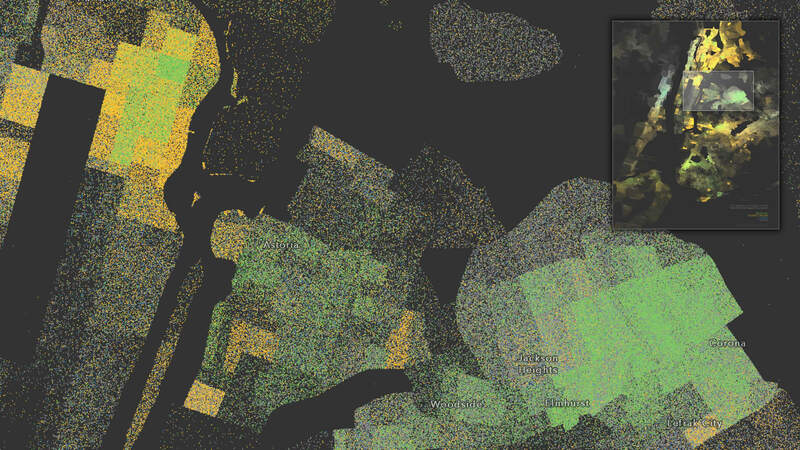 Knowing very little of the social fabric of NYC, this map provides some interesting footholds for questions. Maps don’t necessarily have to answer questions; the more interesting ones help us ask questions we wouldn’t have known to ask. If you are from the area, and can provide insights, I’d be super interested to hear them. Human geography is such a fun and beautiful field. Don’t hesitate to comment on neighborhoods that stand out to you. 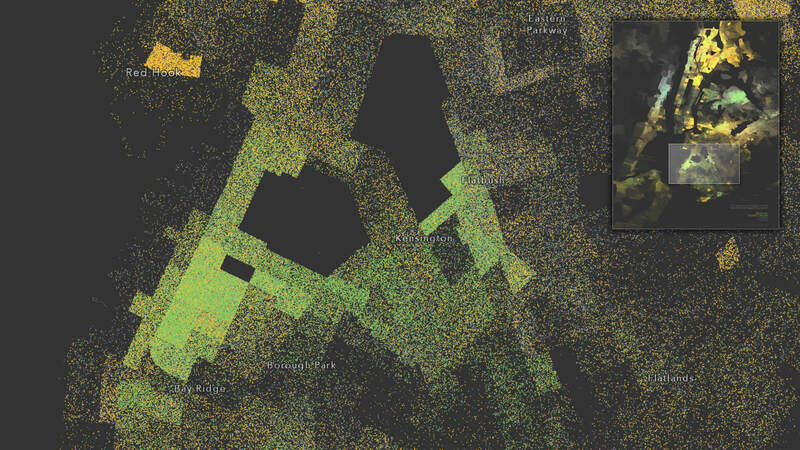 What makes these neighborhoods distinct? What are some of the defining features of these neighborhoods? What might be the social and historic backstory to these neighborhoods, as home to their distinct Hispanic communities? The City’s Hispanic population is especially prevalent in the Bronx. There is a predominance of Hispanics of Puerto Rican origin in this area with a handful of neighborhoods with greater numbers of those of Mexican origin, like Fordham, Concourse, and Soundview. To the west, across the Hudson River, the West New York community of New Jersey is home to many of Cuban origin. 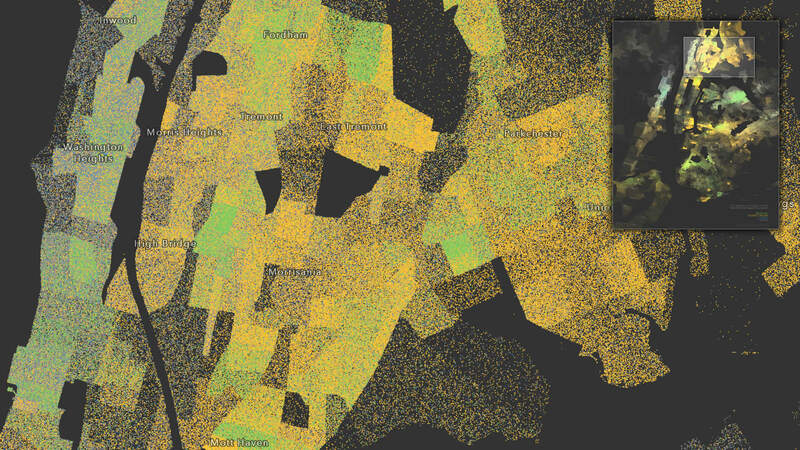 Jumping east, we see a high population of people of Puerto Rican and Mexican origin in the East Harlem area skirting the northeast corner of Central Park. Over the river in Queens, Hispanics of Mexican origin live in higher numbers, particularly the neighborhoods of Corona and Elmhurst. Moving south, the East Village community in Manhattan, and the Williamsburg community of Brooklyn are home to a relatively higher density of Hispanics of Puerto Rican origin, while the Bushwick area is home to many of Mexican origin. 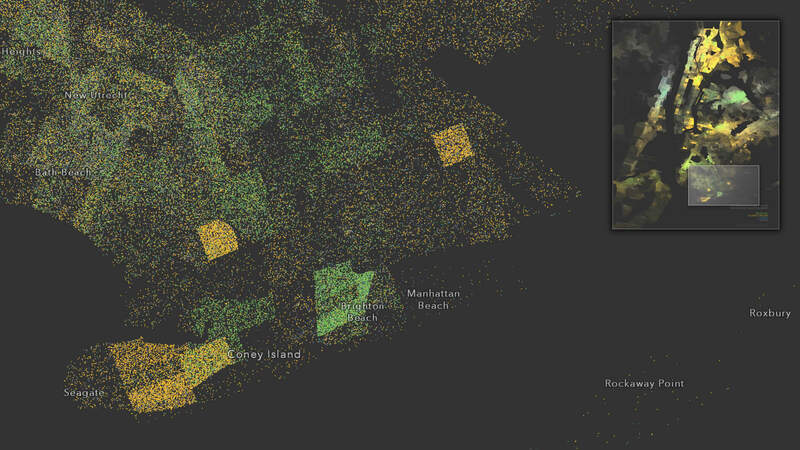 Likewise, the Sunset Park area of Brooklyn shows a higher concentration of those of Mexican origin while the Red Hook area east of Coffey Park is home to many people of Puerto Rican origin. The coastal neighborhoods of southern Brooklyn are home to several distinct blocks of Puerto Rican origin population like Gravesend and the housing units near the Herman Dolgon Playground. Brighton Beach is home to an increased density of Hispanics of Mexican origin, while Neptune and Mermaid Avenues near Kaiser Park are home to a blend of both. 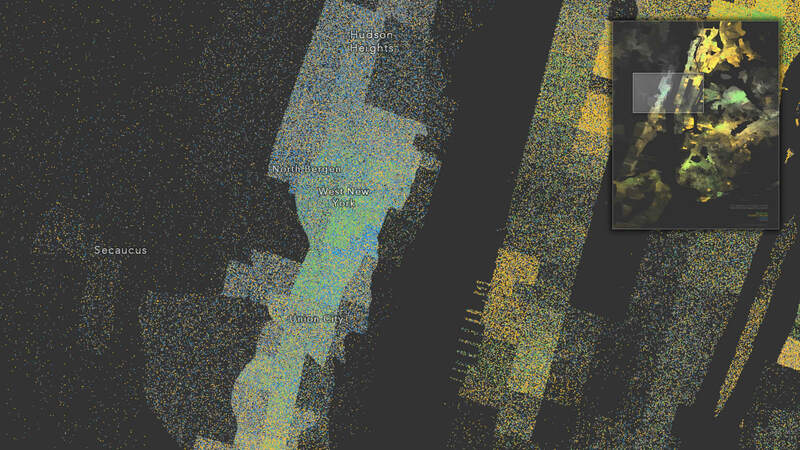 Dot density maps are amazing tools for visualizing the varying terrain of a phenomenon, especially when it comes to reckoning (and reconning) the complex and rich context of human geography. 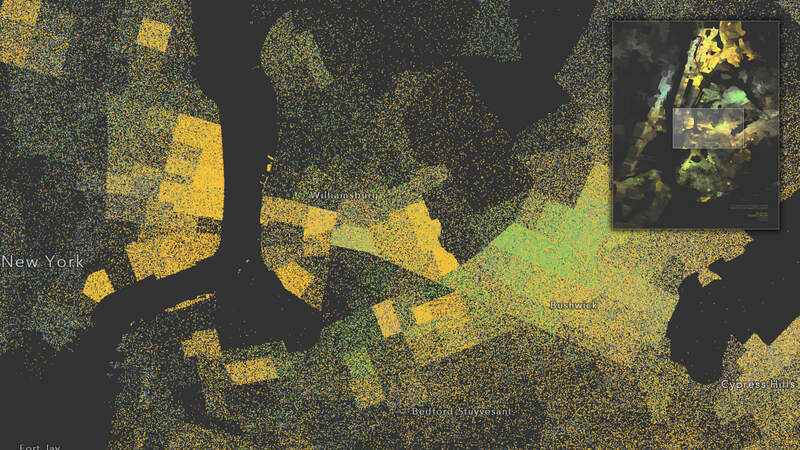 Here are some thoughts about why dot density mapping can be an effective resource as well as when it isn’t.